Prepare to be amazed by the breathtaking sunrise lake views! 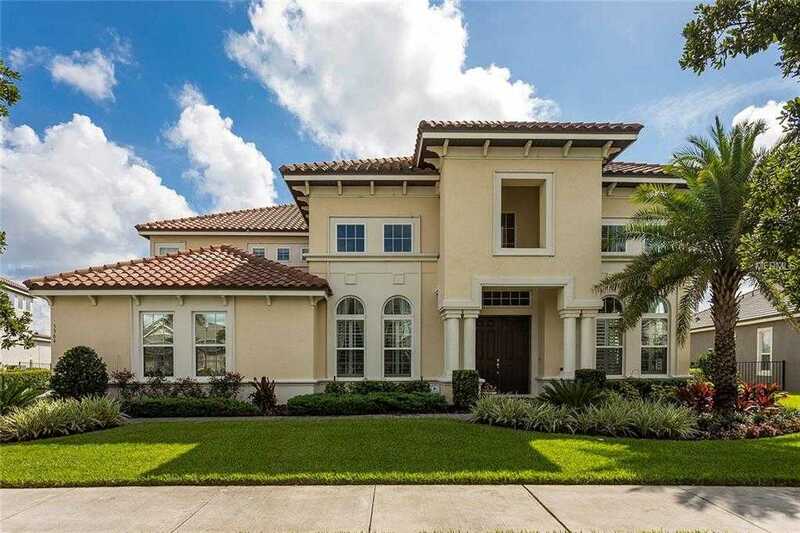 Sitting on Lake Hancock, this spacious 2-story home features 5,600 Sq. Ft. of living space, 5 beds, 6 baths, and a 3 car garage. No details have been missed in this charming home. Elegant ceramic tile throughout the main floor, wood flooring in the master bedroom and office; crown moulding, tray and coffered ceilings, custom woodwork in the kitchen and on the bar wall, and custom cabinets throughout all bedroom closets, laundry room, and office. On the main floor, a generous master bedroom is emphasized by abundant natural light, relaxing lake views and a bathroom with soaking tub, separate shower, walk-in closet with built-ins and dual vanities. The 1st floor also includes formal living and dining rooms, office, laundry room, an open concept kitchen/family room combo, and a screened & covered lanai to enjoy the Disney fireworks over the lake every evening. The kitchen is a chef 8217;s dream with top-of-the-line stainless steel appliances, island, walk-in pantry, and eating nook. Upstairs you will find an in-law suite with expanded closet, plus 3 other beds and baths, a loft area, balcony and media room to entertain family and friends. Hamlin is an attractive community with plenty of amenities such as a community resort style pool, fitness center, boat ramp, and miles of walking trails. Located near the 429, 10 mins from Disney, and a short distance from shopping and restaurants this home is a great opportunity to enjoy the Florida lifestyle.